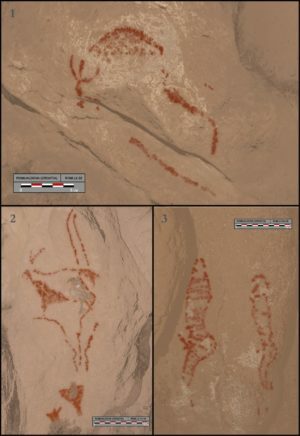 UNIVERSITY OF SOUTHAMPTON—An international team, led by an archaeologist from the University of Southampton and the University of Bordeaux, has revealed the first example of Palaeolithic figurative cave art found in the Balkan Peninsula. The cave art was first discovered in 2010 in Romualdova Pe?ina (‘Romuald’s cave’) at Istria in Croatia, when Darko Komšo, Director of the Archaeological Museum of Istria, noticed the existence of the remains of a red color in a deep part of the cave. This discovery expands the so far sparse register of Palaeolithic art in south east Europe. It makes Romualdova Peina the first site where figurative Palaeolithic rock art has been discovered in this area. Together with Badanj in Bosnia and Herzegovina, the two are the only examples of rock art from the Palaeolithic period in the Balkans.